Welcome to Decembers Alaska Achievers Blog Hop where demonstrators around the world, who earned the Alaska incentive trip will share fun projects using current Stampin' Up! products. 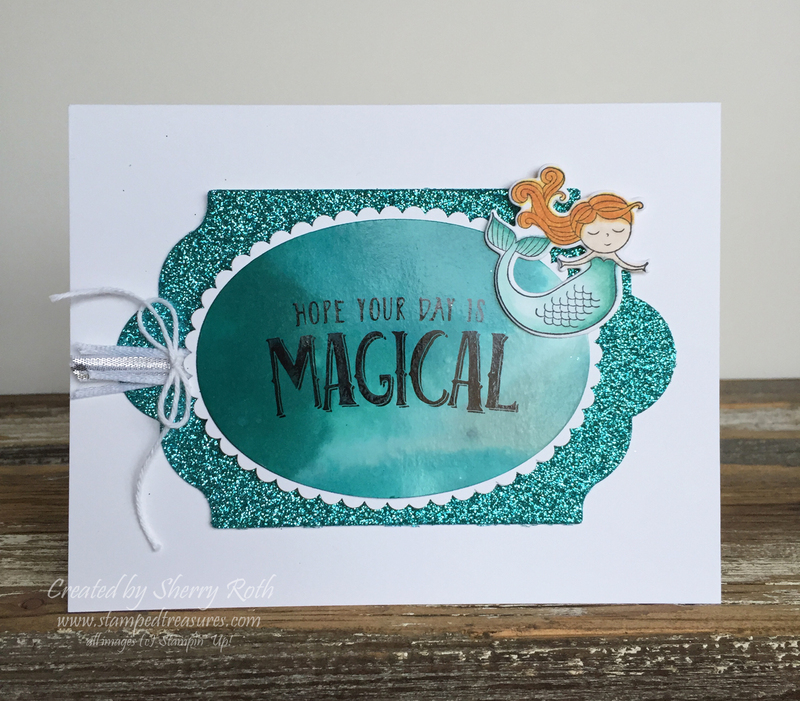 My name is Sherry Roth, from Canada and I am happy to share with you an adorable project created using the Magical Day stamp set from the upcoming Occasions catalogue. The Myths and Magic Suite is one of my favorite suites from the Occasions catalogue. Although my kids are passed this stage in their life, We have several other littles in our lives for whom I can make birthday card. I also have plans to use it in my memory keeping AND my planner! Just need a little time to play. In the meantime let's take a look at today's card. Saturate your glossy cardstock with rubbing alcohol. Add drops of ink refills, use more drops of the lighter colors and fewer drops of the darker refills. If the refill is really dark and there is a lot of that color it over powers the smaller colors and you loose the contrast. Mist with more rubbing alcohol and move the cardstock around so that the colors blend. You may need to use your finger to blend the colors if you find that they aren't blending the way you'd like. Use your heat tool or set it aside to dry. Make sure that your cardstock is completely dry before you stamp on it. I used black archival ink but you can also use Staz On ink. I used one of the ovals from the layering ovals to cut it out and then matted it with the appropriate sized scallop oval cut from whisper white cardstock. 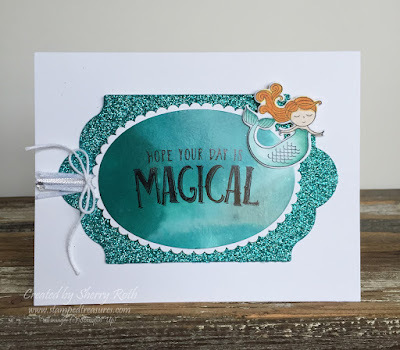 The mermaid was stamped with memento ink and colored in using our Stampin' Blends and the glimmer paper was cut from the second largest framelit from the lots of labels framelits. The Magical Day stamp set, Magical Mates framelits and the Myths and Magic glimmer paper will all be available January 3rd when the occasions catalogue goes live. However, if you don't want to wait, you can make them part of your starter kit today and earn 20% to 25% off your future purchases! Sounds pretty sweet doesn't it? If you are Canadian and would like to purchase your customized starter kit, you can do so here. Thanks for joining me today on the blog hop! There are many more stops full of inspiration, be sure to check them out. You are currently visiting Sherry Roth at Stamped Treasures.